Male urinary continence is afforded by two levels of resistance. First is the prostatic urethra, a thin, narrow tube which provides a passive resistance (similar to the resistance noted when blowing though a thin straw) which require no thought process from the patient. The other is the active resistance by the pelvic floor muscles. These muscles need to voluntarily contract in order to provide resistance. Most men rarely ever have to use these muscles. As such, the male pelvic floor muscles are rarely used and often “out of shape”, particularly in men 50-70 years of age. 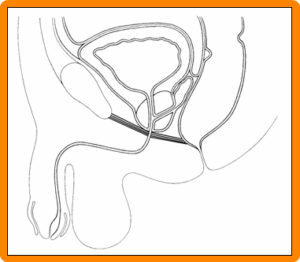 Following radical prostatectomy, the only source of resistance to urinary flow is the pelvic floor muscles. Therefore, it is essential that the patient start training this muscle group well before surgery to prepare for the workload. The following exercise program is highly recommended to optimize the use of Kegel exercise. The Kegel exercise, named after Dr. Arnold Kegel, is an exercise designed to strengthen the pubococcygeus muscles. The exercises consist of the regular clenching and unclenching of the muscles which form part of the pelvic floor. The aim of Kegel exercises is to increase muscle tone, endurance and contraction strength to the pelvic floor muscles in order to develop the necessary resistance to stop urinary leakage following radical prostatectomy. To make sure you know how to contract your pelvic floor muscles, try to stop the flow of urine while you’re going to the bathroom. Once you have found the right muscles to use, only do Kegel exercises when you are not urinating. As your muscles become stronger — and you become more experienced with the exercises — this movement will be more pronounced. A cautionary note: Don’t make a habit of starting and stopping your urine stream. Doing Kegel exercises with a full bladder or while emptying your bladder can be very uncomfortable. It can also lead to incomplete emptying of the bladder, which increases your risk of a urinary tract infection. If you’re having trouble finding the right muscles, don’t be embarrassed to ask your doctor for help. He or she can provide important feedback so that you learn to isolate and exercise the correct muscles. Once you have identified your pelvic floor muscles, empty your bladder and get into a sitting or standing position. Then firmly tense your pelvic floor muscles. Try it at frequent intervals for five seconds at a time, four or five times in a row. Work up to keeping the muscles contracted for 10 seconds at a time, relaxing for 10 seconds between contractions. Prior to radical prostatectomy, we recommend doing at least 100-200 contractions, spread out throughout each day. Be careful not to flex the muscles in your abdomen, thighs or buttocks. To get the maximum benefit, focus on tightening only your pelvic floor muscles. Also, try not to hold your breath. Just relax, breathe freely and focus on tightening the correct muscles. Perform a set of 25-50 Kegel exercises at least three times a day. The exercises will get easier the more often you do them. You might make a practice of fitting in a set every time you do a routine task, such as checking e-mail or commuting to work. Do your exercises at the same times every day. For example, you can do Kegel exercises when you wake up in the morning, after lunch, and at bedtime. You may want to keep a Kegel exercise diary. Write down how many times each day you do Kegel exercises and how many exercises you do each time. Following radical prostatectomy, continuation of the Kegel exercises are important to ensure good pelvic floor muscle tone and endurance. However, what is essential is the establishment of the automatic reflex of contracting the pelvic floor muscles when performing any body movement which will increase the abdominal pressure. This includes standing up, squatting down, coughing, laughing, etc… These maneuvers increase the pressure inside the bladder and force the urine out through the urethra. If the valve mechanism is not tightened at the right time, urine will leak out! As such, timing of the pelvic floor contraction is essential to become pad-free and leak-free (continent) following prostate surgery. We recommend practicing before your surgery of purposefully coughing and doing the Kegel contraction at the same time. Start developing this association as soon as possible.